With more than 600 fully illuminated billboards located on all major roadways throughout Minnesota and Western Wisconsin, billboards are our bread and butter. Franklin Outdoor Advertising is positioned to deliver high-traffic, cost effective Rotary Bulletins, Poster Panels, Digital Billboards, and Permanent Highway Bulletins. 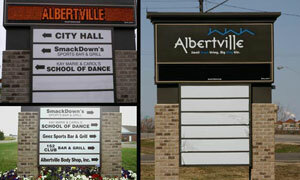 Our graphics division has complete print and design shop capabilities for the full spectrum of outdoor graphics needs. Our graphics team operates multiple Grand Format and Large Format printers for the production of everything from vehicle graphics to yard signs and banners. 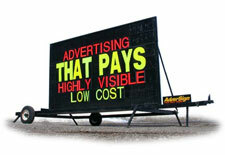 Adversign's products include 4' x 8' and 6' x 10' portable signs placed in front of local businesses on a temporary basis. The vibrant colors used on our signs deliver an immediate impact to passing motorists and pedestrians. Effective and eye catching on premise signage is an important element in the overall marketing efforts of retail businesses. Attractive signage not only identifies a local business, but it also invites consumers to stop. Electronic message centers allow businesses to advertise price specials, discounts and special events.